Painter, muralist. Born in Westerhever, Germany on Feb. 28, 1857. Having been apprenticed to a local painter at an early age, Sammann began working as a fresco painter in Dresden while in his teens. While there, he was a pupil of Wilhelm Ritter for four years at the Industrial Art School. In 1881 he sailed to New York where he worked as an interior decorator and muralist. For health reasons, he migrated to California in 1896. For about two years he was active in San Diego and San Francisco but then moved to Pasadena. The many frescoes he painted in local residences are examples of the German rococo style. Detlef Sammann was very important during his professional career in California, both in southern and northern California. 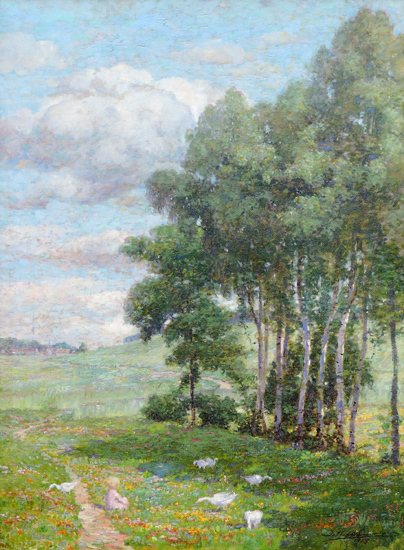 His earlier work, while in Los Angeles, was compared to that of Monet. 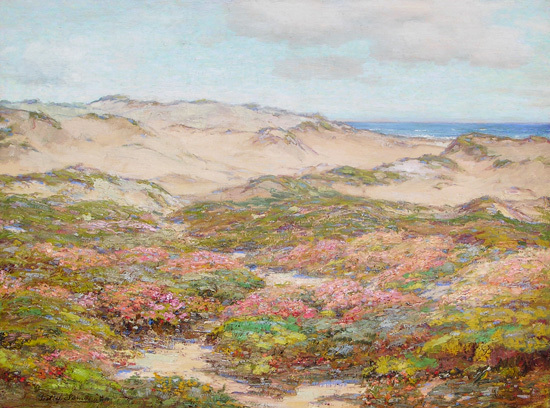 Upon retirement in 1912, he moved north to Pebble Beach and adopted an Impressionist style. Inspired by the local scenery, he painted landscapes, coastals, and marines. Sammann spent the war years in this peaceful place but, homesick for his native land, he returned to Dresden in 1921. He died there on May 25, 1938. Exhibited: Pasadena Art Union, 1896; Blanchard Bldg (LA), 1910; Calif. Art Club, 1911; Daniell Gallery (LA), 1911; SFAA, 1911-14; Del Monte Art Gallery, 1912; Friday Morning Club (LA), 1914; Exposition Park (LA), 1914; NAD, 1915; Golden Gate Park Memorial Museum, 1915, 1916; Panama-Calif. Int'l Expo (San Diego), 1916 (silver medal); Kanst Gallery (LA), 1916. Source: Edan Hughes, "Artists in California, 1786-1940" Interview with the artist or his/her family; Los Angeles Times, 11-26-1899; California Impressionism (Wm. Gerdts & Will South); American Art Annual 1915-17; California State Library (Sacramento); Southern California Artists (Nancy Moure); Der Freiheitskampf , 5-29-1938 (obituary).